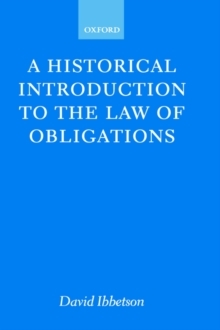 The English law of obligations has developed over most of the last millennium without any major discontinuity. Through this period each generation has built on the law of its predecessors, manipulating it so as to avoid its more inconvenient consequences and adapting it piecemeal to social and economic changes. Sometimes fragments borrowed from other jurisdictions have been incorporated into the fabric of English law; from time to time ideas developed elsewhere have,at least temporarily, imposed a measure of structure on a common law otherwise messy and inherently resistant to any stable ordering. In this book David Ibbetson exposes the historical layers beneath the modern rules and principles of contract, tort, and unjust enrichment. Small-scale changes caused by lawyers successfully exploiting procedural advantages in their clients' interest are juxtaposed alongside changes caused by friction along the boundaries of these principal legal categories; fossilized remnants of old doctrines jostle with newer ideas in a state of half-consistent tension; loose-knit rules of equity developedin the Chancery infiltrate themselves into more tightly controlled Common law structures. The result is a system shot through with inconsistencies and illogicalities, but with the resilience to adapt as necessary to take account of shifting pressures and changing circumstances.